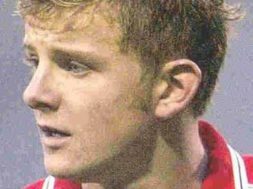 On August 9th 2003, English football lost one of its most promising young footballers when Manchester United attacker Jimmy Davis sadly died in a car crash on his way to make his debut for loan club Watford. STEVEN FYFE recalls his time at Swindon Town and talks to some of Jimmy’s old team mates. 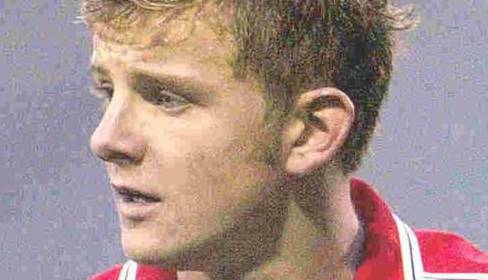 The previous season he had spent a small period on loan at Swindon Town, making 15 appearances and scoring 3 goals, and so the news of his death affected fans and former team mates alike. Town kicked off their season just a couple of hours after the news broke, and fell to defeat at Sheffield Wednesday. A fortnight later the Davis family were guests at Towns 4-0 home win over Notts County where Jimmy’s mother stood on the pitch giving an emotional, heartfelt speech to the fans and the following pre-season, Town played Redditch (Davis’ local side) in the inaugural Jimmy Davis Memorial Cup – a game that Town won 2-1. A number of players from that team were contacted to offer their thoughts on Jimmy as we enter the 14th anniversary of his passing…. It is hard to say just what Jimmy would have gone on to achieve, but what is easy to say, is that in terms of ability and talent, he’s probably in the top three young players I played with. I would say it was also a certainty that he would have gone on to make his Premier League debut for Manchester United. I thought he was almost Gascoigne-esque in the way he would go past players. He had great strength for someone so young and also that ability to pick out a pass or deliver the perfect cross. It was his individuality on the pitch that made him stand out. We had a brilliant spirit at Swindon that season and Jimmy fitted in straight away. There was a great atmosphere on the training ground and he fully embraced his loan move. He did not have an ego that you might expect of a kid coming from United, he was happy to roll his sleeves up and adjust to life in the 3rd tier. He was also very funny, sometimes mischievous and full of energy. I always felt he had the right balance of being a very talented and confident footballer whilst remaining a very humble boy. I remember playing against him and his great mate Danny Webber when I was a young player at Chelsea and you could see then that they both had real ability. I think even in those early days most football people in England were aware of Jimmy. It was no surprise that he was at the most successful club in the country. Jimmy’s death was a very upsetting time for all of us. We were getting ready to play Sheffield Wednesday on the opening day of the 2003-04 season when we heard about his accident. I was in my early 20’s and it was a terrible shock. It was very difficult to go out and play football and there was certainly an eerie atmosphere inside the County Ground that day. Team mates like Matty Heywood and Steve Robinson had become big mates with Jimmy and our manager Kingy absolutely loved him. I don’t remember much about the game apart from we lost and that I didn’t really want to be there. The following year we played a memorial match against his hometown club Redditch United. It was a lovely way for us as a club to show what an effect he’d had on us during his time in Wiltshire. I’ve always kept a picture of the two of us celebrating a goal in my home and he’s someone I think about a lot. Jimmy was a great player, unbelievably quick and sharp. Great ability on the ball but worked his nuts off too. Had a great work rate that you’d expect from someone that plays for United. I remember in one of his early training sessions me and Jimmy were doing some shuttle runs next to each other, I’m sure you can remember how quick I was….it was embarrassing!! He was one of the nicest lads you’ll ever meet. Coming from United to Swindon, he didn’t give it the big ‘un. He got on with everyone straight away. A proper chirpy little jug eared brummie who loved the banter (giving and taking). We dragged him down to League one level on one Tuesday night with a day off Wednesday. A few of us went into Town for some food and a couple of beers. Jimmy being a good pro said he wasn’t drinking but we persuaded him to have a couple of pints…..10 Guinness and blacks later he was smashed and loving it. I don’t think that was the done thing at United!! I remember hearing that a Watford player had died in a car accident as I was driving to the home game against Sheffield Wednesday. It was only about an hour before kick off that we found out it was Jimmy. The dressing room was devastated and I think that showed in the fact we were 2-0 down inside 10 mins. We ended up playing pretty well but losing 3-2 in 37c. I remember playing Notts county at home, his family came to the game, a few of the lads were in tears in the minute silence. We battered them 5-0 I think. He was a great player but an even better lad. How good a player was he? An extremely gifted player. Very powerful, quick on the dribble, great strength on the ball, very technical and an eye for goal. What character was he on the training ground? He was a very focused and hard working player, a tough competitor – wanted to win, but knew how to have fun and enjoy the game as well. Any stories from your time together? Unfortunately none I can remember. I lived away from Swindon and remember that he was also travelling in most days. 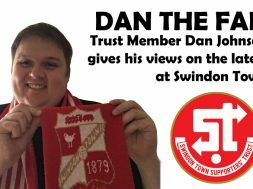 He did talk a little about his experience being on the bench for United in the Champions League – all I can recall is that his appearance bonuses in those games made my Swindon contract seem minuscule. How did it impact you/the team when you heard about his death? Losing a team mate, someone who you share a changing room with, and go to work with on a daily basis, is tough no matter how little you may know the person. It puts things into perspective, and makes you appreciate all that you have. It is hard to believe and accept. It did bring the team closer together. I lost another team mate during my time at Portsmouth, Aaron Flahavan. For a while in both instances, it made me question things, drew my focus away from the game, took my motivation away as well. In those times I wanted to be with my family and my friends. It took a while to shake it off. Thank you for making me part of this and I take this opportunity to congratulate Jimmy´s family for the kind of kid he was. I remember him coming the first day to training from such a big club and behaving very shy, but he soon settled into the group. He was very lively and a joker, but a quiet lad at the same time when us the oldies came to the scene. We shared a few head tennis games at the training ground, a hard competition before and after training where bets could be won or lost!! On the technical side you could see that Jimmy had a different quality as a player, he could take defenders on very easily. The gaffer and us knew he was one of our best players during his spell at Swindon and we were all very sad at what happened later. All the best Jimmy, wherever you are. Although I never knew Jimmy well, the day before he passed was the day we spoke in the physio room at Watford. He came on loan from Manchester United to Watford just as I was on my way on loan to Swindon. He told me the club was a good club and he enjoyed his time there. This small connection ties myself and Jimmy to Swindon with both of us having great times there, and both being at Watford for periods. Unfortunately his story did not continue but to get to where he got was a massive achievement.